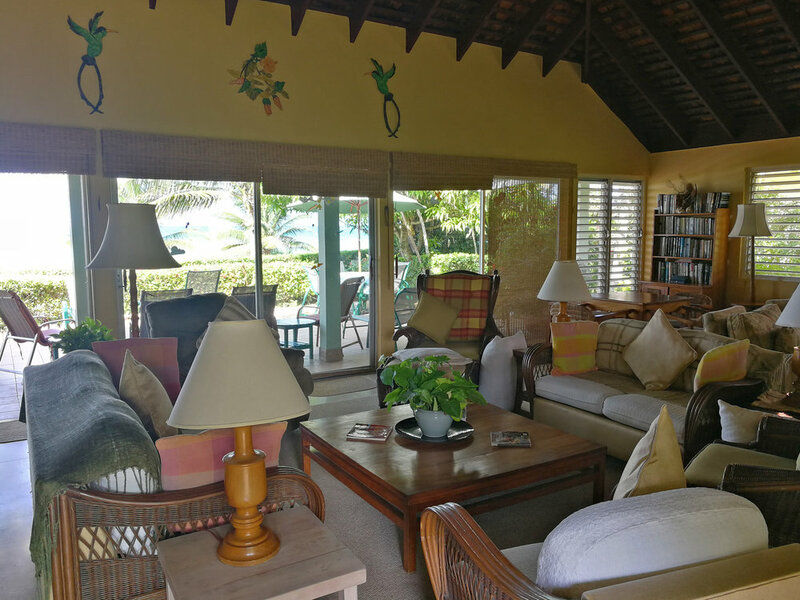 EbbTide is a spacious and comfortable holiday beach villa surrounded by manicured gardens and ideally located on the beach at Silver Sands, Jamaica. Sleeps 1-8. 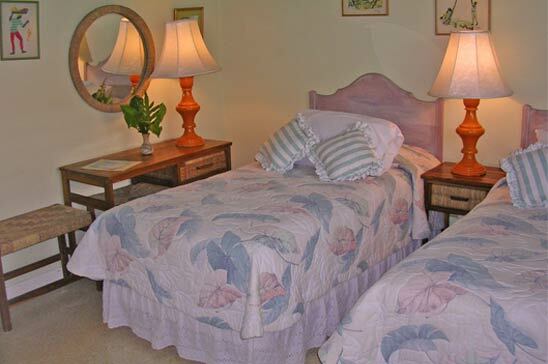 EbbTide is a charming home away from home, offering four air-conditioned bedrooms, each furnished with its own private bathroom. The large open concept living/dining area faces the ocean with a series of sliding glass doors that give constant access to the prevailing trade winds. All rooms are additionally equipped with ceiling fans. EbbTide's furnishings, wall colours and decorative accents have all been carefully selected to reflect a warm and laid back Jamaican vibe. The seaside trellised patio is furnished with a cotton hammock and lounge chairs. This is a great area for additional dinning, relaxing, sun tanning and enjoying evening cocktails while taking in a sunset. EbbTides garden spills onto powdery white sand with the clear blue Caribbean sea a stones throw away. EbbTide guests are able to enjoy this ‘west beach’ almost exclusively, as it is completely separate from the ‘east beach’ which is the hub of Silver Sands. 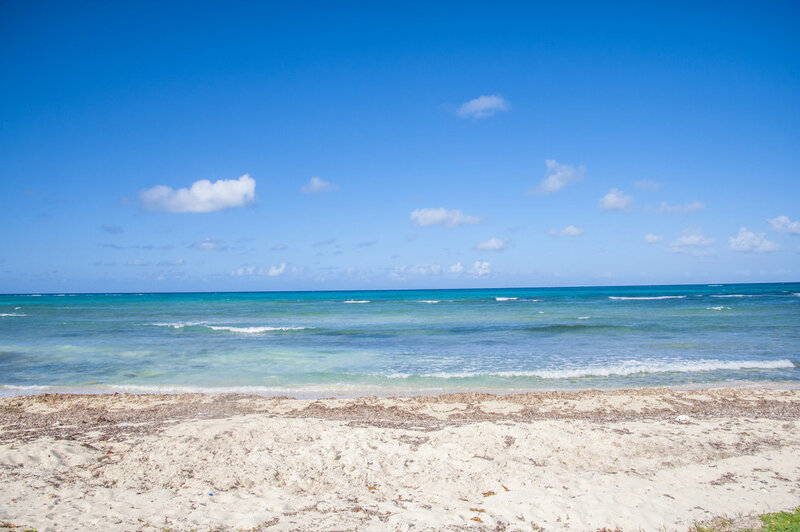 Here you can wade or snorkel in the shallow water, take a leisurely stroll at the water’s edge, collect sea shells, soak in the amazing setting sun or simply drink in the peace and beauty that Silver Sands is known for. Charm will ensure that your vacation is hassle-free and perfect in every way. She will make arrangements for your groceries to be delivered to the villa should you not wish to make the trek into the village yourself. She will also be happy to arrange daily excursions with our friendly tour guides or massage therapists and manicurists for your pampering pleasure. Best of all, EbbTide includes the live-out services of Charm, your house manager and Hyacinth, your gourmet Jamaican cook. Hyacinth's lobster in garlic sauce, roast pork, Jamaica-style fried fish, banana bread and key lime pie will become a favorite for sure. Maisie and Charm live in the rural village of Spicy Hill, not too far from EbbTide. Should you wish to share a never-to-be-forgotten Jamaican experience, they will be only too happy to invite you to their hillside church for Sunday worship. Roy, EbbTide's gardner is also happy to contribute to your holiday experience. He will pick coconuts when in season from our garden so you can sample refreshing coconut water or arrange with the local fishermen to deliver the ‘catch of the day’ right to your doorstep. Facilities at EbbTide include cable TV, CD/DVD player and ADSL internet service. The owners of EbbTide are either school teachers or librarians and they are proud to offer a wide assortment of reading material from their wonderful library. So, curl up with a book and learn about the diverse and rich tapestry of Jamaica or simply lose yourself in a contemporary romantic novel. Whatever your fancy, the key ingredient of an EbbTide holiday is relaxation...pure and simple. "Beautiful home was on the beach and a brief stroll from the beach club and bar. Our cooks were five star and prepared great Jamaican Dishes. Day trips to Ocho Rios and Montego Bay are available." "The trip was wonderful:-) I truly appreciate everything:-) Hyacinth and Charm were perfect. So was the villa. We Loved it. The big beach and the pier was awesome, we spent much of our time there and on the patio of the villa. The food was spectacular:-) best cooking ever! I even changed the way I cook when I came home. Again, it was awesome." "We are not leaving. We are not leaving. You all were sweet, kind and lovely. The beach was great. Maisie & Charm were wonderful. Great food, very sweet staff, home always tidy. We love you guys!" "Thank you for a perfect holiday. Maisie & Carla your food was great! Everyone was friendly. Love the place, the view, the ocean. Will do our best to come back. " "Maisie & Carla (Charm) showed us real Jamaican hospitality. This was the best week ever! Food was awesome. We will be back!" "We had a wonderful time! EbbTide was perfect and relaxing. The view was spectacular. Maisie & Charm took good care of us in the kitchen and around the house. We will be back absolutely sooner than later!" "Our 18th stay at EbbTide! Maisie, Carla and Roy took great care of us. We will always be back!" "This is the best, the absolutely best experience ever! I love you guys! Can’t wait to see you all again. I’ve had some of the most amazing food. You are now my family."